To make slides clearer for your audience, put one point on a slide. Take a slide with 3 bullet points, for example, and turn it into 3 slides. Then add an image, diagram, or chart to illustrate the point. The benefits? Audiences can integrate one point at a time more easily than three. They remember it better, too. The slide is simpler, so it has more impact. Your audience listens to you rather than reading the slide ahead of you and then tuning out. At the same time, get rid of an overdone, irrelevant template and let the illustration stand on its own. The technique? Easy! Here are steps for this bulleted slide with 4 bullets on it. 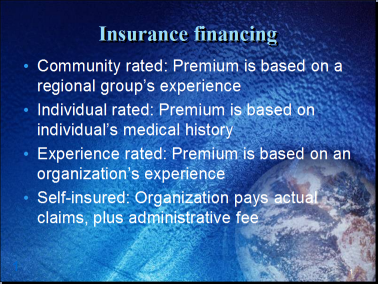 It describes the 4 ways that insurance companies finance health insurance. First, think about images, diagrams, or charts that will best illustrate your point. If you’ll use images, find high quality photos and save them in the same folder as the presentation.. If you’ll use diagrams, sketch them out. For charts, gather the necessary data. If you haven’t formatted the slide master as you want, do that now. For example, this slide would be better with a sans-serif font throughout and a left-justified title. Bottom vertical justification is also preferable if you’ll have titles that take up 2 lines. Duplicate the slide. Click the slide in the slide pane and press Ctrl+D 3 times, for a total of 4 identical slides. Click the first slide in the slide pane. If your illustration will take up everything but the title, change the layout to Title Only. Right-click a blank area of the slide, choose Slide Layout (Layout in 2007), and choose the Title Only option. then delete the body text placeholder on the slide. In our situation, we won’t change the layout. With the first slide displayed, delete the bulleted text, leaving only the first point. Click the border of the placeholder and click the Bullets button, to remove the bullets. Insert the image you want to use. Or create a diagram, or chart. If you use an image, you’ll often need to crop and resize it. Use the Crop button on the Picture toolbar to crop the image. (In 2007, use the Crop button on the Format tab that appears when you select the image.) Drag the corner handles to resize it, remembering the too much resizing may make the image unclear. Then move the image to the desired location. Move and resize the text placeholder so that the text fits with the illustration. You may have to, or want to, adjust the title placeholder as well. Two nice layouts that anyone can create easily are shown here. Continue with the rest of the slides, so that each slide has one point and an accompanying illustration. Makeover an existing slide today! You’ll be amazed at the difference! Banish bullet-heavy slides from your life! Watch a free video of this tip on YouTube! Thanks Ellen, that’s great advice, and a neat explanation of the benefits.